DNA replication is an extraordinarily complex multi-step process that makes copies of the body’s genetic blueprint. It is necessary for growth and essential to life. Conventional telephones convert sound waves into electrical signals that can be transmitted vast distances through wire, and which are then converted back into audible sound at the receiving end. A similar form of communication may be required to achieve DNA replication. Only in this case the telephone wire is DNA and the telephones are unique clusters of four iron and four sulfur atoms within the multi-protein “machines” that copy it in a highly coordinated fashion. This model of replication has not yet been proven. But in a report published this week by the journal Science, the Caltech/Vanderbilt team demonstrates the existence of the chemical switch that they believe plays a central role in enabling our genes to be copied efficiently. 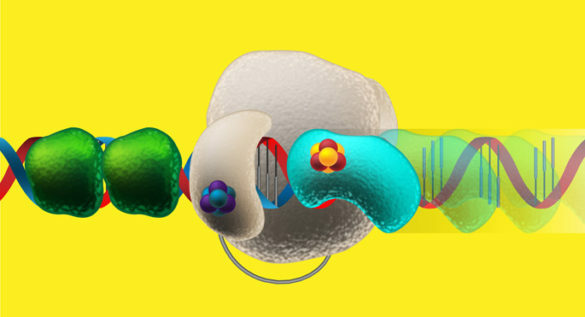 “We propose this as a fundamentally new transformative idea about how you could get communication between proteins over very long spatial distances using DNA as a wire,” said Walter Chazin, Ph.D., the Chancellor’s Professor of Medicine, professor of Biochemistry and Chemistry and director of the Vanderbilt Center for Structural Biology. “This chemistry provides a means of long range, rapid communication for processing genomic DNA,” added Jacqueline K. Barton, Ph.D., the John G. Kirkwood and Arthur A. Noyes Professor of Chemistry at Caltech and the paper’s co-corresponding author with Chazin. Barton, who chairs the Division of Chemistry and Chemical Engineering, has spent decades studying DNA charge transport — the transmission of electricity through DNA — as a verifiable and biologically important phenomenon. In 2007, Chazin and his colleagues reported finding a cluster of four iron atoms and four sulfur atoms within the protein human DNA primase, the enzyme that “primes” or readies the DNA template before full copies of the DNA can be made. Iron-sulfur clusters are known to drive oxidation-reduction (redox) reactions, a type of chemical reaction that involves the transfer of electrons and which provides the energy for a wide range of biochemical processes. But what role these clusters played in DNA replication and other DNA transformations was not known. Barton believed that iron-sulfur clusters could be used for DNA charge transport in cells and teamed up with the Chazin lab to prove this is important for copying genes. In the current study, the researchers showed that the oxidative state of DNA primase — the number of electrons held by its iron-sulfur cluster — affects how strongly it binds to DNA. The iron-sulfur cluster thus acts as a “redox switch” to coordinate one of the critical steps of DNA replication. The next step of this research is to show that DNA charge transport driven by iron-sulfur clusters enables DNA replication proteins to communicate with each other and synchronize their actions. Iron-sulfur clusters are found in the multi-protein machines that perform virtually all transformation of DNA. Defects in any of these machines can lead to mutation, genome instability and ultimately cancer, neurological disorders and other diseases. Understanding how DNA processing machines work could lead to fundamentally new avenues for the development of targeted therapies. Study co-authors were Caltech graduate student Elizabeth O’Brien, Vanderbilt graduate students Marilyn Holt and Lauren Salay and Vanderbilt postdoctoral fellows Matthew Thompson, Ph.D., and Aaron Ehlinger, Ph.D. The research was supported in part by National Institutes of Health grants GM061077, GM120087, GM065484 and GM118089, and training grant GM08320.